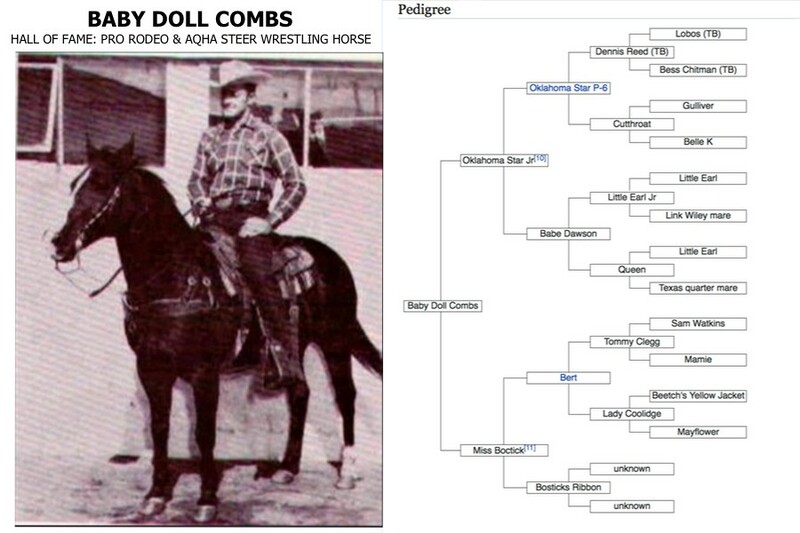 Foaled in 1947, “Baby Doll Combs” was bred by H. M. Boetick of Bloomfield, Iowa and registered with the American Quarter Horse Association (AQHA), as registration number 81,497. At the time of registration, Willard Combs owned her, a steer wrestler or bulldogger who competed in the rodeo circuit in the 1950s. Combs purchased her from Bill Oduum of Pryor, Oklahoma in 1955, paying $3200 for her. Combs not only rode Baby Doll himself, but also allowed other wrestlers to ride her in return for a cut of the prize money. Sired by Oklahoma Star, Jr., the capable Doll had more fans than the men who rode her. Baby Doll’s popularity increased after she was featured in a 1958 Life magazine article. When mature, Baby Doll Combs was a bay mare who weighed about 1030 pounds and stood about 14.1 hands (57 inches, 145 cm) high. She had a blaze and a left hind sock as her only white markings. A short horse is an advantage to a steer wrestler, as it’s closer to the steer. Baby Doll Combs died of a ruptured intestine in 1960. She died at a Kansas rodeo, but her owner had her returned to Checotah, Oklahoma where he lived so that she could be buried on his ranch. Many of the cowboys who had earned money off her were present at the ceremony, and a photograph of them at the graveside appeared in Life Magazine. Baby Doll Combs was inducted into the AQHA Hall of Fame in 2004. The PRCA honored her in 1979 by inducting her into their ProRodeo Hall of Fame in the inaugural group of inductees.